US Secretary of State Hillary Clinton held talks Monday evening with Prime Minister Benjamin Netanyahu, at the end of a day of meetings with Israel’s leaders on Iran, Palestinian peacemaking and America’s desire to see Israel heal its ties with Turkey. Clinton reportedly urged Netanyahu to mend ties with Turkey and make moves to jump start peace talks with the Palestinian Authority. So here we have Ms Clinton telling Israel that it should apologize to Turkey because its soldiers defended themselves when Turkish thugs, in a provocation orchestrated by the Turkish government, tried to kill them. Next, Israel should give in to PLO demands for freezing construction East of the Green Line, releasing prisoners, and who knows what else (the demands change from day to day) in order to restart negotiations which cannot possibly lead to anything but further impossible demands. Oh — give them more weapons. I forgot that one. Naturally they can’t possibly hold ‘peace talks’ without weapons. You will recall that the PLO will not recognize Israel as belonging to the Jewish people, nor will they stop dedicating children’s summer camps to terrorists like Dalal Mughrabi. In fact, I can’t think of a single compromise or concession that they have ever made in order to move the ‘peace process’ along. This is how the US treats Israel, an ally. I’m sorry, but this isn’t the relationship you have with an ally. You don’t pressure it to surrender to its enemies, you don’t create obstacles for it — you may remember that it was President Obama who originally came up with the idea of freezing construction in the territories — and above all, you don’t ask it to compromise its security. 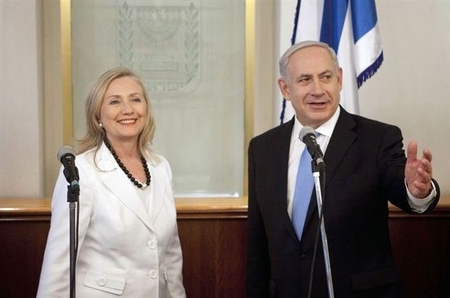 Clinton reportedly told Netanyahu he should hurry to achieve peace with Palestinian president Mahmoud Abbas and Prime Minister Salam Fayyad, since it was not clear who would replace them. This wins the monthly Bad Advice Award with an oak leaf cluster for Cluelessness: does Clinton think Hamas would honor an agreement made with Abbas and Fayyad? Doesn’t the precedent of the peace treaty with Egypt, which is now being ‘reexamined’ by the new Islamist regime, tell us that you can’t count on treaties made with despots to survive them? Clinton is asking — telling — Israel to trade land and security, which it cannot easily get back if things don’t work out, for a promise of peace from an illegitimate Palestinian regime (PA elections are long since overdue) that would be overthrown in a moment if the IDF didn’t protect it and the US didn’t finance it. This entry was posted on Tuesday, July 17th, 2012 at 11:01 am and is filed under General. You can follow any responses to this entry through the RSS 2.0 feed. Both comments and pings are currently closed. SOME days you just shake your head???!! Vic, I shake my head EVERY day I wake up and have to come to grips with the fact that this NIGHTMARE of an administration is still in office. I’m developing a repetitive stress disorder in my neck from this, I think. I don’t know how Bibi keeps a straight face through all of this. He’s probably sitting through this nonsense, wondering whether to laugh, to cry, to scream, to leap across the desk and choke the life out of this twit, or any combination thereof. No doubt about it, Bibi sure does earn his pay….. It is difficult to believe that Secretary Clinton is so totally devoid of understanding of the situation as to give such ‘useless’ advice and really mean it. Perhaps her public advice is just a bit of PR. Perhaps not. Perhaps she and Obama are in fact totally devoid of understanding of the Middle East, the Arabs, the situation facing Israel. Perhaps. There is however no perhaps about the sickening nature of the US coddling and promoting Erdogan’s Turkey at the expense of democratic Israel. To understand them, you have to realize that to them – Hillary Clinton and the crowd behind her – ideology means nothing. It follows from this that the fact that Israel on the one hand is a liberal democratic state, and that Turkey or Egypt or Saudi Arabia on the other are not, means nothing. What matters to them is America’s immediate perceived material interests. These are defined as “stability” – as in lack of war – in the world’s most important oil producing region. And that means safety from terrorist attacks. So, how, in a day-to-day, immediate sense, does the U.S. maintain “stability” in this part of the world – i.e., keeping oil prices down, and not requiring new and expensive U.S. military actions – and discourage Islamist terrorism? To them, this means humiliating Israel in front of the Moslem regimes, to show them, so they can show their own people, that the U.S. cares about what they care about: weakening Israel. Maybe then, less of them will want to carry out terrorism against the U.S., and/or the relevant regimes will help us control/stop them from doing so. This also means preventing Israel from defending herself against their endless provocations. They don’t have the military strength to defeat Israel outright, but maybe if they can make Israel and Israelis miserable enough for long enough with unending pressure and hostility, they’ll all ‘go back to where they came from’ (see Helen Thomas). And, if Israel WERE to defend herself as any other self-respecting state would, and be supported as any other supposed “ally” would, well, that might lead to a big bloody war that could spin out of control, make the price of oil go through the roof…and make Americans uncomfortable and a shaky financial/economic situation a lot worse (and, Obama might not get re-elected…boo hoo). That is the “logic” we are dealing with here, Shalom. The proponents of this nonsense call themselves “realists”. I call them “cowards”. Or, “Arab whores”. Of course these policies won’t work. The Moslems find all sorts of excuses for attacking all sorts of countries, many of whom have impressive anti-Israel credentials (e.g., France, Russia). Restraining Israel can’t work forever. At some point, Israel will have to defend herself. And when she is cornered and desperate enough – as Obama seems to be ensuring she will be by the time she comes out swinging – she’ll fight that much more viciously, with that much more of an unpredictable and potentially devastating outcome. It makes a lot more sense to treat your allies like, well, allies. That might even deter Israel’s enemies, and there would be a lot MORE peace and stability then. But that makes way too much sense for minds that are diseased by anti-Semitism, and/or drugged by petrodollars, or by academia post-colonial drivel narratives (all three factors are operative in the cases of both Obama and Ms. Clinton). Six months to go but who’s counting?